Ride The Loop in style! We have seven different Loop cycling jersey designs as part of our endangered species series. Arm warmers and leg warmers in most designs also are available. 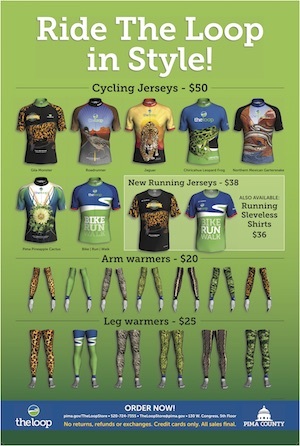 We also offer running shirts (short-sleeve and sleeveless) in two styles for both men and women. And we’re now offering Loop T-shirts, sunscreen, and hats! Sizes tend to run small, we recommend reading through our FAQs and checking our sizing chart. Be advised that ALL SALES ARE FINAL. No refunds or exchanges. Sales payable by credit card only. We are unable to make sales by cash or check. Loop gear can be purchased at Pima County's Attractions and Tourism Office, located on the fifth floor of the County Administration Building, 130 W. Congress. For more information, call 520-724-7355 or email TheLoopStore@pima.gov.